Recently I got involved in a Dixieland-based musical project that required a banjo player. They couldn't find any legitimate Dixieland banjo players to get involved, so I volunteered to retrain myself as necessary and play the part (though I haven't played Dixieland banjo for something like forty years). I already owned a 5-string banjo (a legacy of my Folk background), but it's not played the same as the 4-string banjo that the music was written for. I could have taken the fifth string off of mine and retuned it, but I didn't want to sacrifice having a 5-string for the duration of the project. So I wound up buying a second banjo, which gave me an excuse to shop for a new toy. That was a plus. But, as a minus, I also found myself explaining the different kinds of banjos again and again, to the director of the musical, to the director of the orchestra, and even to a 20-something 5-string player who kept feeding the others misinformation. This experience reminds me that many things that were "common knowledge" among musicians when I was a kid no longer are. So here's a breakdown of why different kind of banjos exist, and why two or three instruments that are nearly identical require such different techniques and produce such different sounds. If you don't play banjo or guitar already, parts may be a bit difficult to follow, but there's a summary at the end you should find useful. Depending on how you interpret the history, the banjo either came from Africa or evolved among enslaved African peoples in North America. By 1860 or so, the old photos and songs indicate that the banjo was popular with white musicians, too. By 1885, most banjos had 5 strings, which included a "drone" string located next to the lowest string on the banjo. The "Fifth string" was seldom fretted - sometimes it wasn't even over the fretboard, so it always played the same note. Strumming techniques (similar to later Dixieland techniques). We'll pick up our discription from about a century ago, when the banjo was establishing itself as a critical element of early Jazz styles. As early Jazz music (what folks often call Ragtime) evolved, it was only natural that the banjo would become part of the sound. Jazz players eventually abandoned the drone string, because it was incompatible with most keys and chord patterns of early Jazz. Strumming overtook fingerpicking, because the banjo was used largely as a rhythm-keeper, and strumming helped the old "open-backed" banjos compete with brass instruments in volume. Strumming was usually done with a "plectrum" - the ancestor of our "flatpicks." All four strings were strummed at once, often very quickly. Eventually 4-string banjos and rapid strumming techniques became intrinsic to Dixieland playing, and to the Tin Pan Alley songs that imitated Dixieland. Songs like "Has Anybody Seen My Gal?" and "Alexander's Ragtime Band" are two examples of Tin Pan Alley songs that typically use a strummed banjo. By the time such songs were popular, 4-string banjos had found their way into many homes as well. When other kinds of banjos and banjo playing emerged, this kind of banjo became known as a "Plectrum" banjo, to distinguish it from banjos that were intended to be played without plectrums. At first, "Plectrum banjos" kept the long necks of their 5-string brethren. Scale lengths were 26"-28", and there were typically 22 frets between the nut and the head. Tunable drum head, originally mounted on a wooden frame (like a tambourine), but eventually mounted on a metal frame and equipped with metal clamps that could be tightened or loosened to adjust the tension on the drum head. Long wooden neck with chromatic fretboard and mechanical tuning knobs on the head. Most plectrum banjos built before 1920 had "open back" construction, meaning that there was nothing between the back of the drum head and the banjo player's belly. Many tenor banjos (a slightly smaller variation) are still open back. This structure give the plectrum banjo more "plunk" than "ring," which actually works better for music that has fast chord changes. It also helps keep the strummed banjo from being too loud to sing over without vocal strain. By about 1920, two features that increased volume and sustain were often added. Resonator, a wooden shell that fastens to the back of the banjo body, adding depth, volume, and sustain to the tone. Tone ring, a solid metal ring that is either part of the body's frame or firmly attached to it, which adds volume and sustain. These features help modern plectrum banjos compete in volume with larger bands; however, some plectrum players remove the resonator when they want a more authentic early sound. Most plectrum banjos are tuned (going from the highest to lowest strings) in D, B, G, and C, a tuning that was popular on 5-string banjos at the time. Modern plectrum banjo players may use this tuning, but many of them use a later tuning. As pointed out earlier, traditional plectrum banjo is strummed with a flatpick, usually with a down-strum on the down-beat. Often the strums come pretty fast, including thirty-second notes on some songs. When a Plectrum banjo player does play a single-string solo, he or she continues to use a flatpick. On a slow solo, the player often uses a rapid picking technique like that of a European mandolin player. If the right hand has it comparatively easy, the left hand has it much harder. Because of the complex chord structures of Dixieland and Tin Pan Alley songs, plectrum banjo players need to know as many Jazz chords as the average Jazz guitarist - much more than most banjo or guitar players. To add a little more challenge, many Dixieland banjo solos are played by choosing chords that have the melody note at the top of the chord. Consequently, you will use one Eb chord for when the melody goes down to an Eb, another one for when the melody goes to G, another one for when the melody goes to Bb, and another for when the melody goes to high Eb, and so on. Advanced players almost never use "open chords," so 95% of the chords they play are made by sliding the same twelve or so chord shapes up and down the neck. But the short version is that Dixieland banjo is NOT as simple as it looks or (sometimes) sounds. As Dixieland banjo styles became more demanding, manufacturers experimented with a shorter scale to maker the low barre chords easier to play, going down as low as 21 3/4". They also tried going down to 17 frets, but that didn't provide Dixieland banjoists enough range to play the melody on the top string as was their wont. So they went to 19 frets, and a scale as long as 23". This is now is considered "standard," although many 17-fret banjos survived and several are still made. Tenor banjos resemble plectrum banjos in construction and optional features. Dixieland-style players who need volume still opt for resonators and tone rings when they can afford them. Folks who use tenor banjos for other styles of music may prefer the sound without those options. Though some folks experienced with plectrum or 5-string banjos still use the old plectrum tuning (DBGC), most tenor players today tune their tenors like a viola, in straight fifths (A, D, G, C). This actually makes playing jazz chords and scales easier than the old plectrum tuning. A few folks (including former guitar players) tune their tenors like the highest four strings of a guitar (sometimes called Chicago tuning - EBGD). I did that once in 1970 for a Broadway musical pit orchestra and felt like I was "cheating," but apparently I'm not the only one. When the tenor is used for jazz, it is generally strummed like a plectrum banjo. However, many other styles of play have been used over the years. Across the Atlantic, musicians in Ireland and the UK were experimenting with 17- and 19-fret tenor banjos by the mid-20th century. Many of the "early adopters" were mandolin players, used to playing the melody. Tuning their banjos an octave lower than their mandolins allowed them to use the same chords and scales. This EADG tuning (going from the highest string to the lowest) gave them almost as wide a range as a guitar. They didn't need long necks like the Dixieland-style players did, so many were quite happy with the 17-fret banjos, but 19-fret banjos are just as common, and occasionally you'll see a 22-fret banjo played this way. Generally speaking, "Irish banjo" refers to a specific tuning and style of playing. Most so-called "Irish banjos" are identical to tenor banjos in every other respect. Again, some folks prefer open-back and some prefer resonators and tone rings. If you're used to playing to lively audiences you may need the extra volume. The "Irish Tenor" banjo tuning is the lowest of them all. Not only is it a great way for mandolin players to get variety in their sound. It also helps an instrument that frequently plays melody to blend in better with other traditional instruments. In Celtic music and some other folk genres, a low-pitched tenor banjo (E, A, D, G) is often flatpicked, with an emphasis on individual notes, flatpicking patterns, or arpeggios. Here's an irony - Irish musicians sometimes flatpick a 5-string the same way, using it to play melodies or arpeggios. That has got more than one 5-string player "hot under the collar," but the truth is, the Irish were playing banjos - even 5-strings - that way before Bluegrass was even invented. So get a grip. Since I wrote this article, I have found out a great deal more about 4-string banjos than I have room for in this article. So our resources have expanded. I wrote a separate article about the history of 4-string banjos. I bought two old Asian 4-strings to demonstrate at a local festival and blogged about the experience. I also significantly expanded the content of the Four String Banjo buyers' guide in our sister site Riverboatmusic.com. If you haven't checked those guides out yet, please take a look - they're not just blind lists of links to products. Instead they provide detailed information about features, differences, and uses that most stores an many hobby articles just gloss over or assume you know already. As the banjo found its way to Scots-Irish-descended cultures in Appalacia, the drone string fit right in. After all, folk instruments like the Appalacian dulcimer were already adding extra, unfretted, strings to boost volume. So retaining the drone string on the banjo was only natural. At first, many banjos were hand-made, but metal tone rings were beyond the skill of most rural craftsmen. So the "store-bought" banjo found its way to some very "out-of-the-way" places. Appalacian players seldom had to compete with brass instruments, so they could retain early fingerpicking patterns and develop new ones. Adding metal fingerpicks to resonators and tone rings allowed 5-string players to hold their own even in barn dances and music halls. Folk banjo players like Pete and Peggy Seeger adapted fingerpicking styles to a wide range of folk traditions. In the meantime, back in the hills, banjo players like Earl Scruggs added "blue notes" (flatted thirds, fifths, and sevenths) to help create what we now consider the traditional Bluegrass banjo sound. Both Folk and Bluegrass banjo picking patterns are radically different from the flatpicked strums of traditional 4-string players. Modern 5-string banjos include drum heads that are pretty much identical to those on modern 4-string banjos. They inevitably have a slightly wider neck, at least from the fifth string down. Most of them retain the standard scale lengths (26-28") and neck lengths (21-22 frets) as the banjos of a century ago, though a few (called A-scale banjos) use shorter scales and 19-fret necks. Most 5-string banjos include resonators, which improve volume and sustain. Many include tone rings, which also improve volume and sustain. Like Plectrum banjos, 5-string banjos with resonators and tone rings tend to have more "ring" than "plunk." In addition, the fifth string tends to keep sounding at times when the rest of the strings are being dampened because of chord changes - this adds to the "ringing" effect as well. Most 5-string banjos are tuned (going from the highest to lowest strings) in D, B, G, and D, with the fifth string tuned to high G. This "open G tuning" is standard for Bluegrass banjo and makes it relatively easy to play songs like "Foggy Mountain Breakdown " Folk musicans like Pete Seeger, who used his banjo to play many different styles may use a D, B, G, C, High-G tuning or alternate between the two. Play the third (G string) with your index finger. Use the back of your middle or ring-finger's fingernail to strum downward across the first (High D) and second (B) string. Use your thumb to pick the fifth (High G) string. In a 4/4 song, you would typically pick the third (G) string on beat one, then strum the first and second string on beat two, then pick the G string on the second half of beat two, giving a bum-ditty effect. If you want to play an alternating bass part, you play the fourth (D) string on beat three, then play beat four exactly like you played beat two. You may have noticed that if you're using the open G tuning, it's possible to play a nice banjo part without even using you left hand until it's time to change to another chord. But that doesn't mean the left hand is lazy. Rather it means that the left hand is freed up to add other fancy stuff. 5-string players often add a note to the second half of the first beat by doing something fancy with the left hand. For example, on a first-beat low note that you'd ordinarily fret, you might leave the string open when you first pick it, then fret it on the second half of the first beat. That way you have SOMETHING playing on every beat. This is called "hammering on," in case you wondered - it's an important component of many Bluegrass banjo strums and solos. In addition, if you're playing a melody or solo, you might add melody notes by picking the first or second string instead of strumming it. Most 5-string banjo players use the thumb and first two fingers for everything. Many wear picks on all three fingers to increase their volume. Note: If you're a Bluegrass fan, you should know that you can learn Bluegrass picking on any 5-string banjo that is in playing condition. However, if you want to perform Bluegrass, you need to consider getting a banjo with accommodations like tone rings and resonators that make the things nice and aloud. 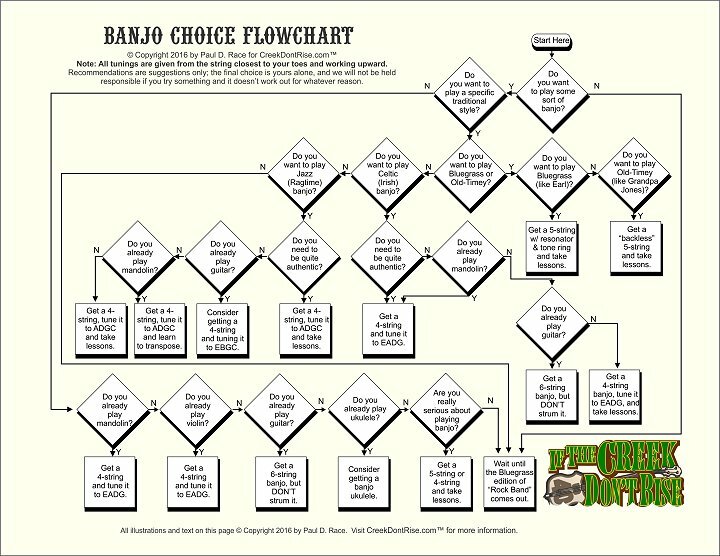 Our article "What is a Bluegrass Banjo" breaks these differences down in more detail than we have room for in this article. To learn more about the various kinds of 5-string banjos, click on any of the banners to the right. Six-string banjos have been around for at least a century, occasionally being used by folks who already played 4 or 5-string banjos when they needed the lower range. Today, most 6-string banjos are strung like guitars, so folks who play guitar already and don't want to take the time to learn banjo can get something like a banjo sound simply by trading instruments. If you listen to the sales drones, a 6-string banjo will make you a "banjo player" overnight. But BOTH 4-string and 5-string banjo players can hear a 6-string banjo from a mile away, and many of them despise it as a "cheater's" instrument. As a person who has dabbled in 4-string banjo and who has played BOTH 5-string banjo and guitar for over 40 years, I believe that a 6-string banjo sounds best if you treat it as a unique instrument. Most modern 6-string banjos have all the bells and whistles of comparable 5-strings, including resonators and tone rings. But they have a shorter scale length than many banjos. For the convenience of guitar players, they retain the 24" scale length of the average steel-string flattop guitar. This, in turn, means that the banjo neck is shorter than the neck on traditional five-strings, and even many plectrum banjos. That, and the six-peg head and relatively wide neck make it obvious to 4 or 5-string players that you're not playing a "real" banjo. But, again, if you take advantage of the instrument's unique strengths, they may not only forgive you, but also ask you how you get that sound. As I stated above, a 6-string banjo is usually tuned to typical guitar tuning with the high to low notes tuned to High E, B, G, D, A, and Low E. When you pick one of these up, it helps to remember that the lowest note on a 5-string banjo is usually the same note you're playing on the D (4th) string of the 6-string banjo. And you have two more strings below that, so you can play nearly an octave below any Bluegrass banjo player. This will only get you dirty looks in some Bluegrass settings. But for other kinds of folk-based music, you may find those lower notes useful. One example of 6-string banjo in popular culture is the banjo introduction to the "Rainbow Connection" from the original Muppet movie. There are "base notes" in the banjo part that can only be played on a 6-string banjo. As mentioned before, many people buy six-string banjos hoping that they'll get the same sound as a 4 or 5-string player. My notes on trying to substitute a 6-string banjo for a 4-string or 5-string are below, followed by some things I've learned about playing the six-string banjo as an instrument in its own right. Substituting for 4-String - If you know Jazz chords on guitar, and you listen to enough Dixieland banjo to get a sense of their sound and strumming patterns, it IS possible to play Dixieland on a 6-string banjo. In fact, at least one professional guitar player (Al Chernet) has gotten solid, well-playing gigs doing just that. After all, there's not THAT much difference between the range of a plectrum banjo and the range of a guitar's highest four strings. (Remember to avoid strumming the lowest two strings - if you're playing with horns and piano, strumming the lower two strings will just muddy the sound.) Our article "Are 6-String Banjos for Real" provides more hints on this application. Substituting for 5-String - Unfortunately most 5-string banjo picking patterns can not be duplicated on 6-string banjo. Maybe imitated if you really know your way around BOTH guitar and 5-string banjo. That fifth banjo string, ringing out on the second half of every second beat has no parallel on a guitar-tuned instrument. So abandon any hope of playing "Foggy Mountain Breakdown" or such Bluegrass classics. And prepare to be beaten about the face and elbows if you bring one to a Bluegrass jam. However, if you're in a group with other acoustic players, and you want to add the impression of a Bluegrass banjo playing along, you might gain some traction with a fingerpicking pattern that "thumbpicks" a bass note on the first beat, strums the top two or three strings with the back of your fingernails on the second beat, and fingerpicks ONE of the higher strings on the second half of the second beat. In fact, I had worked out a picking pattern like this on my guitar some years back, and it sounds amazingly good on the 6-string banjo. Which leads me to . . . In spite of the 6-string banjo's potential use as a "plectrum" (Dixieland) banjo - as long as you only strum the highest four strings, the instrument's unique characteristics are most obvious if you fingerpick the thing. I don't use fingerpicks on this or my other banjos or guitars, preferring to let callouses build up on my right hand so I can get a nice crisp pluck without anything in between my fingers and the strings. If you're already used to fingerpicks, by all means, use them. The bass notes do not have the depth of a wood guitar's bass notes, so they don't provide quite as firm a "foundation" as you might be used to. That said, they have a sound that is unique in acoustic music. When fingerpicked, the strings do not seem to sustain as long as they would on an acoustic guitar. This is especially noticeable when you "hammer on," that is fretting a string after it has been played, to "sneak in" another note that may not fit into your picking pattern - a common Bluegrass banjo technique. On my 6-string banjo, when I "hammer on," I have to "fret with a vengeance" to get the second note loud enough - something that is never an issue on my guitars. Until you get used to fingerpicking the 6-string - including building up right-hand calluses - you'll notice that some notes will play much louder than others, even if you apply almost exactly the same pressure. The answer is to keep practicing until you build up those callouses, and get more consistent with your right hand. If you're used to a guitar picking pattern that pluck the high strings on beats 2 and 4, try substituting a light strum with the back of your index or ring finger's fingernails - once you get the hang of this, it will "sound" more like a banjo, and keep a more consistent balance among strings. To see the our recommended Six-String banjos for various uses, please click the button to the right. If you already play ukelele or mandolin, what are you waiting for? If you don't, you probably shouldn't pick up a uke or mandolin banjo to start on. Many folks know that the ukelele was a popular instrument among young adults in the 1920s. What most folks don't know was that the mandolin was almost as popular as the guitar in North American homes around 1900. When plectrum ("Dixieland) banjo sounds invaded the early airwaves and record stores, musical instrument manufacturers made it "easy" for the hundreds of thousands of folks who already played mandolin or ukelele - they flooded the market with instruments that played like ukeleles or mandolins, but had a drum head, so they sounded something like banjos. New versions are still available today, and many excellent vintage examples are on the used market, often sold as "banjos" with no other description. The ukulele banjo has four strings, like a plectrum banjo, although they're higher pitched. Strummed "properly," the instrument can do a pretty good imitation of a plectrum banjo playing a little "up the neck." If the instrument has "gut" or nylon strings, the plunky sound is reminiscent of pre-1900 banjo, which may be more authentic for certain kinds of music. Some plectrum banjo players double on uke banjo just to add a bit of variety. In fact, ukulele banjos are still available new, and you may be able to find or order one in your local music store. The mandolin banjo has eight strings, almost always metal. The result is that it "rings" more than it "plunks," and can play very loud. Again, it's relatively high pitch, but in a pinch, you can imitate a plectrum banjo playing "up the neck." A few "tenor mandolin" examples have been made with long necks and strings so they play closer to the range of a 6-string banjo, but these are rare. If you already play mandolin, either instrument would be worth tracking down. On the other hand, there's no compelling reason that a mandolin player who wants to play strummed or flatpicked banjo couldn't buy a 4-string banjo and retune it an octave down from his or her mandolin. To learn more about unusual members of the banjo family, click here. A Plectrum or Tenor 4-string banjo tuned ADGC (counting from the string closest to your toes upward) and played with a flatpick is your first choice if you want to play Jazz ("Ragtime" or "Dixieland) banjo. A 5-string banjo is your only real choice if you want to play serious Bluegrass or most kinds of Folk banjo. Play as an instrument in its own right. Ukelele or Mandolin banjos can add new tonalities for folks who already play ukelele or mandolin. I started the following flowchart as kind of a humorous take on this topic, but some folks have found it useful, so I've toned down the snarkiness and included it here. Click on the picture to go to the full-sized printable PDF (hi-rez) version. Mandolin banjos require extremely precise fretboards to play in tune from one note to the next. If the fretboad is inaccurate, send the instrument back - it's not worth fixing. The necks of full-sized banjos must be very solidly attached to the body. If the whole instrument goes out of tune every time you shift your weight from one foot to the other, send it back. Banjo necks must be very straight, and should include an adjustment rod. Sloppy tuning pegs will give you headaches, but could be replaced if it comes to that - just don't bother putting a $100 set of pegs on a $100 banjo. Note about Setting Up Banjos - On top of that, remember that - except for anything in the Deering Goodime line - virtually no stringed instrument that lists for less than $1000 is playable out of the box. Pretty much every Chinese-manufactured banjo I've seen "new" needed the head tightened, the neck adjusted, and the bridge moved into proper position before you can even tell if the instrument is worth keeping. After all that, if you decide to keep the instrument, you will need to replace the strings - factory strings are seldom worth playing before they cross the ocean. Needless to say, mail order or high-volume stores aren't going to do all of this prep for you - it takes time and a certain amount of skill and intelligence. "Setting up a 5-String Banjo"
"Setting up a 6-String Banjo"
"Setting Up Acoustic Guitars and other Fretted Instruments." If you want to check out a used banjo and you know nothing about banjos, take a friend who knows something about them, or at least knows something about guitars - that's better than nothing. Much of the information in our article "Evaluating and Buying Used Guitars" applies to shopping for used banjos as well - the main difference is that there are far fewer used banjos than used guitars in most markets. If you want to take a chance on a cheapie banjo from a volume or mail-order store, go right ahead - just consider that you might need to send one or two back before get one that can be made playable. You'll note that the reviews of cheap banjos usually have 50% people who know how to set them up and are delighted with the value, once they've put an hour or so into getting the thing playable, 20% people who don't know how to set them up and think the instrument was made by Satan himself, 20% people who think it's pretty but haven't figured out yet that it it would be easier to learn on if a technician took a "crack" at it, and 10% people who really did get a bad one and think the store owes them damages for the emotional hardship it has caused. That said, you don't have to spend the value of a good used car to get a great banjo on your first try. Several companies make nice lines of banjos that are solid, well-built, and priced no more than comparable quality guitars. Since I originally wrote this article, Deering has added many models to its Goodtime line, enough to meet the needs of most beginning and intermediate players. But you should shop around, not only for your first banjo, but for someone who you trust to help you maintain it. Please get in touch.if you want to share photos of a unique instrument or ask any related questions.